Goa is an unchallenged Indian tourist destination with many surprises hidden in its unlimited tourist attractions. In order to reveal the secrets of Goa one has to stay at this destination at least for a week or more. Among the many fairs and festivals bonderam festival in Goa is an annual festival celebrated on the fourth saturday of August at Divar Island. Be prepared to welcome bonderam festival 2013 which is approaching fast. Divar Island is located in river Mandovi supposed to be the life line of Goa. Bonderam festival at Divar Island exhibits the rich culture and history of Goa. The island becomes a place of huge celebrations with decorations, floats, flag parades, music and regional dances. Goa was ruled by many foreign powers including the Portuguese, who dominated the region for a quite longer period leaving their impression on the culture of Goa. Bonderam festival originates from the Portuguese word “Bondeira” which means flag. During this festival the island gets captivated with festive mood. A flag parade from main Divar junction is the opening function of the festival, which is followed by a brass band. After this parade the opening of the festival is announced officially. In the later part of the day fancy dress competition is the main attraction for the locals as well as the tourists. 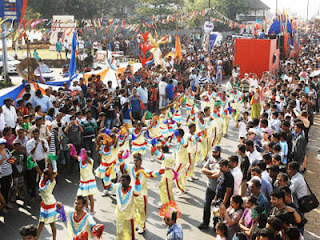 This is followed by the float parade, which is backed up with traditional music as well as live performances presented by some of the popular bands of Goa. This tradition has its roots in the clashes between the villagers and Portuguese administration regarding property issues. Portuguese administration resolved this matter by putting flags which marked the boundaries. This became a tradition in the bonderam festival Goa. Bonderam festival in Goa 2013 will be celebrated on 24th August at Divar Island, which is just ten km from Panaji and it can be approached by ferry from Old Goa. One has to get down at Konkan railways Carambolim railway station for reaching the venue of this festival. This part of Goa is scenic covered with a beautiful green cover. While arriving in Goa you have ample options of accommodations to select from and budget hotels in Goa are one of the best options.